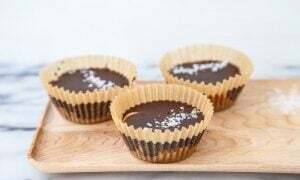 Homemade peanut butter cups made healthy with real ingredients! This is about as Halloween-y as I get. Moving on; it’s not that I’m above spooky homemade baked goods for Halloween. It’s the homemade part that gets me. I want caramel apple suckers. I want those Butterfinger-Reese’s cup hybrids. I want candy corn (omg not the chocolate kind). I want all the things that don’t come out of my own kitchen this time of year. I’ve got too much respect for mass-produced candy to make my own when we are thisclose to Halloween. But, when I saw homemade peanut butter cups in Adrianna’s charming new book, The Year of Cozy, I couldn’t resist. I took a quick peek at the yield (9 peanut butter cups), divided that by my usual serving size of peanut butter cups (90), and decided this was the perfect batch of candy for two. Adrianna also has several other small-batch recipes in the book, which just makes my heart smile! Her book is a big heart-smile for me because it’s basically how to be a cool girl. She has delicious recipes, easy crafts, and pretty things. She also shares her secrets for being happier and doing more of what you love. I’m going to say it first and hold everyone to it: she’s our generation’s Martha Stewart. After reading her book, you just want to be her because she’s so dang cool. Gosh I love her! I glanced over the ingredient list for her homemade peanut butter cups, and realized that even the chocolate is homemade. I mean, I know Adrianna is amazing and so of course everything she makes is amazing by default, but the ingredient list made me jump into the kitchen immediately. The homemade chocolate part is similar to my homemade candy bars (that just so happen to be healthy and paleo!). Place liners into 9 muffin cups. In a small bowl, beat together the peanut butter and confectioners' sugar. Add a pinch of salt if the peanut butter is unsalted. Beat until light and fluffy. In a medium bowl, whisk together the cocoa powder, coconut oil, maple syrup and vanilla extract. Whisk until very smooth. Spoon 1 tablespoon of the chocolate into each liner. Freeze for 5 minutes. Add 1-2 small scoops of peanut butter on top of the frozen layer of chocolate. Top the peanut butter with the remaining chocolate, and place back in the freezer until firm. Add additional flaky sea salt on top, if you like. As the proud father of 2 girls and 2 dachshunds, we ALWAYS say Happy Halloweenie around here. Love how you said weenie on your blog. Now that’s a blog I can commit too. Ok, PB cups. It’s just common knowledge that every mans love language is Peanut Butter. (and we all hate coconut….right?!?) Making this. OK, making my mom make these. Can’t promise I’ll hand them out for Hallow-weiner. They look nice. What I like is that even chocolate is home made. I’m not much of a halloweeny person either. I LOVE candy, but I’m just not into the black cats, spider webs, ghosts, and other creepy crawlies. But these? These I can definitely get behind. Love the sea salt on top! I’m wanting to sprinkle it on everything these days. Reese’s Pieces are my absolutely favorite candy ever…sooo yeah…I’d eat these. Love that you put a little salt on top, fantastic idea. Pinned and trying fo sho! These peanut butter cups are to-die for! I love that the chocolate is also homemade! How brilliant! You saved me so much time from thinking about what to make for Halloween!! This is perfect :) The buttercups look divine!! Haha. Love the chocolate math you did. Makes sense! And I agree with you, I have so much respect for store-bought candy–it’s incredible if you actually think about it. Also thanks for calling me cool! 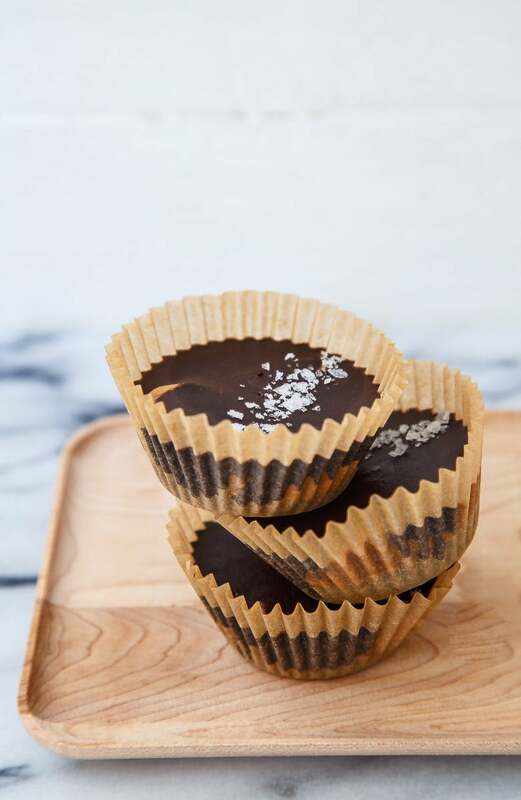 Peanut Butter Cups are my all time favourite candy…making them at home looks so easy. Thanks for the inspiration! oh yummy for my tummy!! I made these with melted butter instead of the coconut oil, and I topped them with a sprinkle of cocoa nibs for a little crunch. So yummy!